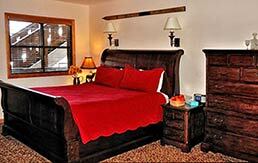 Our Chamonix Deluxe rooms occupy most of our fourth floor addition which was completed in 2003. Each individually furnished and decorated room varies in size from 290 to 380 square feet. All of the Chamonix Deluxe rooms feature beautiful new bedroom furniture in addition to the wet bars each with sink, refrigerator, microwave, and coffee maker. These rooms all have new flat screen TVs and DVD/VCRs. Our Chamonix Deluxe rooms offer the best views in the hotel, and possibly the best views in Aspen. Some rooms face Wagner Park, downtown Aspen, and Red Mountain beyond. On the other side, your room faces Aspen Mountain overlooking the St. Regis Hotel. 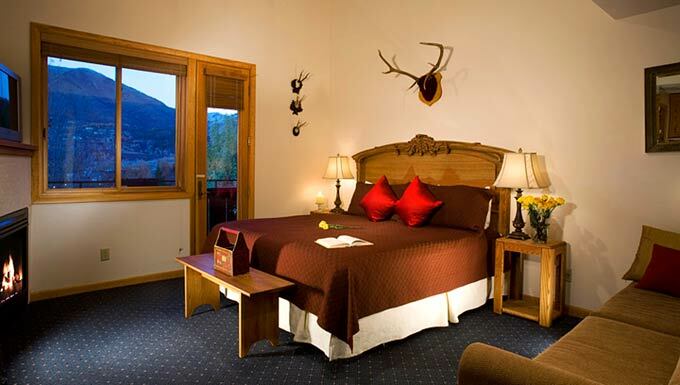 One of our Chamonix rooms is oriented the other way, with views of Shadow Mountain and the St. Regis hotel on one side and east Aspen, Smuggler Mountain, and the pool on the other.